A good friend recently stopped me cold as I was taking verbal potshots at Husband. He surprised me into silence by offering me a temporary solution and giving me time to stop what I was doing — and to think better of it. Husband and I were having dinner and conversation at the home of some friends recently. The four of us stood around the kitchen chatting, laughing, talking over the week as we waited for the lady of the house to finish preparing supper. I’d been cranky with Husband that afternoon, and hadn’t let it go. My irritation was showing rather obviously in my pointed comments. I wasn’t grumbling, exactly. I think snarking is related to grumbling, though. I was making short, pointed comments, saying things that were unnecessary and, well, not terribly nice. I was being honest, but there was no kindness, either in making the snide remarks to my husband or subjecting friends to them. 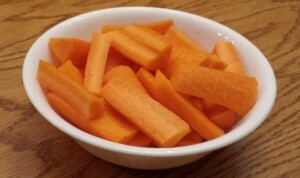 After one particularly tart comment, the gentleman of the house smiled at me and held out a bowl of carrot sticks. I was taken aback. I think my jaw may have dropped. It felt like everything stopped for an instant while I processed all that was contained in that short speech. One, the fact that he had noticed the comments and identified them as something I’d prefer not to indulge in. Two, that he was bringing the fact that I was snarking at Husband into the open. Three, that the solution he was offering was brilliant in its simplicity. That moment of delay, along with the element of surprise, was enough to derail my train of nastiness. It helped that a friend offered the solution. If Husband had done so, things may not have gone as well. I took a handful of carrots and crunched my way through them before speaking again. As I did so, I returned to a better frame of mind and realized how compelled I had felt to make the comments, but how unhappy I felt making them. This is a strange dichotomy, and I recognize it, but it’s one I’ll explore another time. It was unexpected to have a friend point out my snarkiness so honestly. However, this friend is honest to a fault, so I really shouldn’t have been surprised. My role tends to be that of the rose-coloured-glasses wearer, the optimist. And I was not behaving according to normal parameters. As I think about this anecdote, I realize that two good things came out of it. I now have a simple and very concrete tool, a quick and effective way to stop myself from saying something I’d rather not say, even if I feel tempted. And I am reminded that having good friends can help me be my best self — and make me laugh while they point it out. I will look at a bowl of carrot sticks differently from now on. They are more than just low-fat crunchy snacks; they are a tool. A tool that I predict will become a staple at dinner parties from now on. As I understand it, the term “growlies” comes from the world of gaming. Sometimes gamers would decide that one of their party needed to stop talking because he or she was getting into mischief or trouble in the game. Who knows? In any case, it’s going into the bag of holding! The great thing is that this is a very flexible technique. I think chocolate may work just as well, if not better. Any thoughts on this? Have you used a similar technique? Do you know the origin of the word “growlies”? Comment or send an email to susan at goodbyegrumblings.ca. I’m interested in knowing if anyone else uses this technique, and does it actually work with chocolate, or is the crunch crucial? ←Want to find and do a lot of good? Join Scouting! I love this, Susan! I think it’s safe to say that you’re not alone in your sniping (not a lone sniper?!). Awareness is always the first step. Carrot sticks are a good second step! I sometimes use the WAIT (why am I talking) technique, but sometimes it’s too late It’s good in a pinch when growlies aren’t close at hand. Thanks for the reminder about Why am I talking! I like the sound of “happy crunch”! No doubt an understatement if you are anything like me! I’d be willing to test out your crunch vs chocolate query with some Skor bars or finer crisp butter toffees enrobed in chocolate. Let me know which works better for you! All in the name of science. Debbie – MMMMMMmmmm “enrobed in” — there are not enough words or emojis to successfully describe the appeal. You’re welcome. I’m afraid I prematurely hit send – I wanted to go on at length about how wisdom comes from the most unexpected places… but then I needed to pay attention to some urgent thing. And, I wanted to say that freeing up your mouth after a good, sticky toffee takes a while, too – during which time you can often rethink a few things. But our mutual friend has something with the carrots. They, and channelling some energy into crunching them up as violently as necessary, are definitely better for you and your teeth! Its always nice to discover a tool such as this. I have a few questions I ask myself when I am aware I am or made aware I am sniping. Is this something I want to continue doing; is this a battle I really want to go to; how important is it; and most important, what’s my part in this? I find that this works to diffuse my poor behavior. It doesn’t work all the time, but it works some of the time. I love your blog Susan, wonderful food for thought!!! Those are good questions to crunch on. Into the bag of tricks they go!